Who Names Their Kid ‘Chi Chi’? I call it Pink Ruellia, but it’s also known as Hardy Pink Petunia. 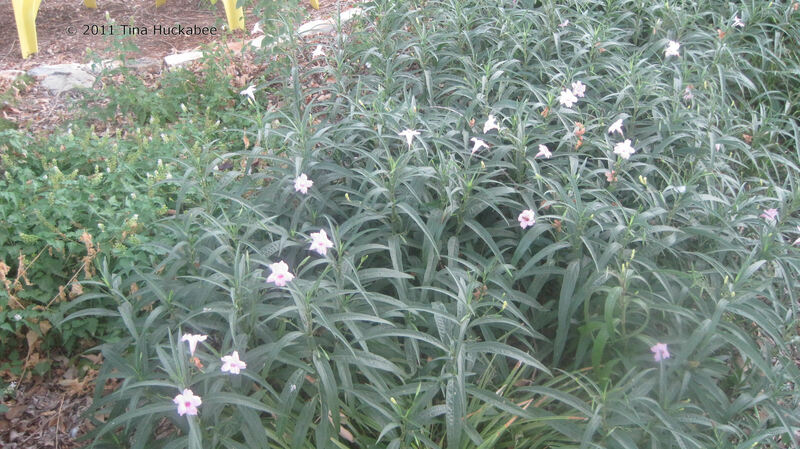 The official name is Ruellia brittoniana ‘Chi Chi’. I don’t know why the ‘Chi Chi’, and I wish whomever thought of that name would think of another. But, there it is. I like this plant. Someone gave me a couple of starts many years ago– I don’t even know how long ago. One source that I read said that it’s a great plant to grow except in more tropical climates because it can grow “too well.” No kidding! 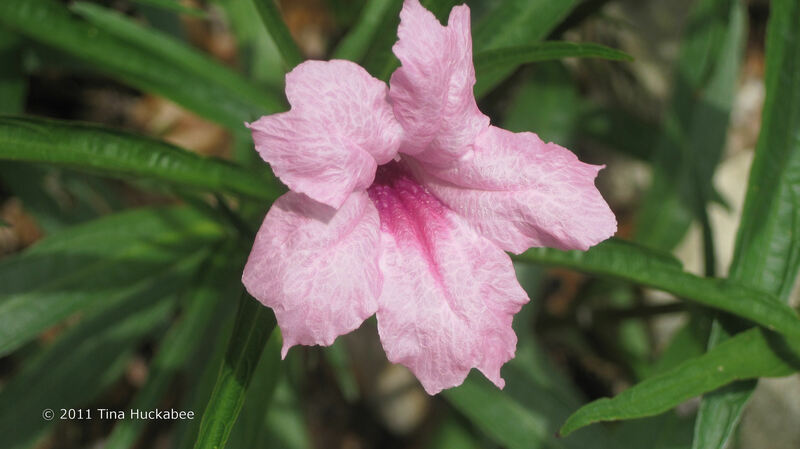 ‘Chi Chi’ Ruellia can be grown in full to part sun, blooming best in full sun. 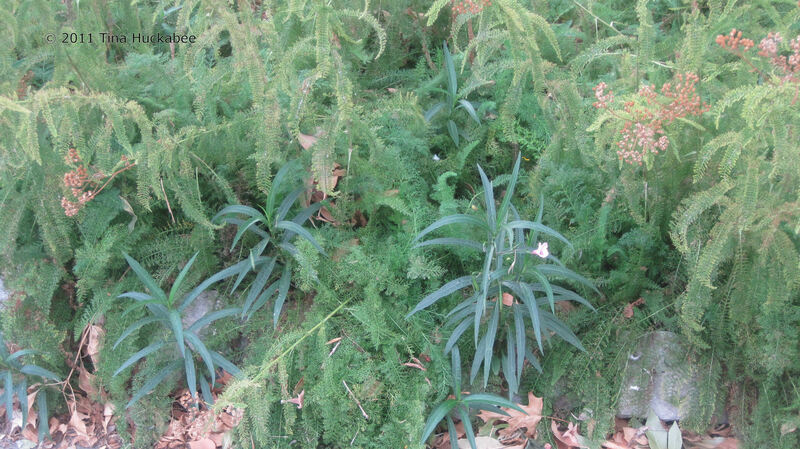 I have several colonies of this plant and I’ve especially liked them in my front garden, which is shady. The plant grows as individual stalks and this adds vertical structure to the garden. The sprinkling of flowers at the upper portion of the stalks is an added bonus. Even though they don’t bloom quite as much in shade, the flowers are soft and light and the foliage is attractive: dark green and slender. 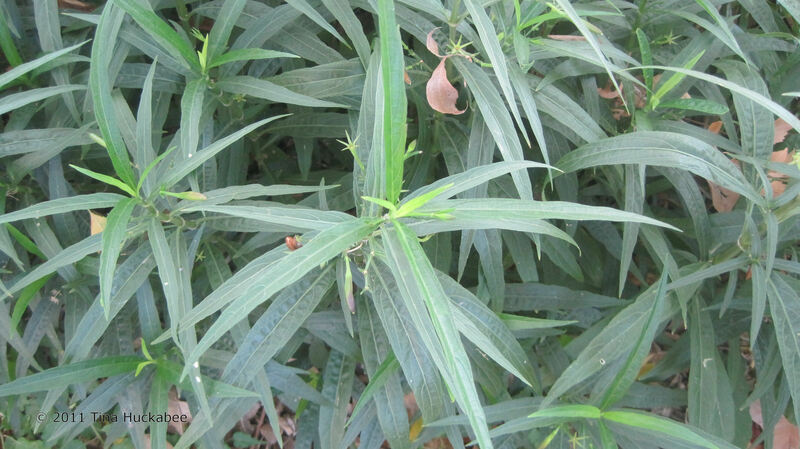 The leaves are opposite and grow the length of the stalk. I especially like the ‘Chi Chi’ foliage after the first light freeze because the leaves develop a deep burgundy tinge and this adds richness to the fall/winter color palette. ‘Chi Chi’ is a herbaceous perennial so after a hard freeze, the plant dies to the ground. 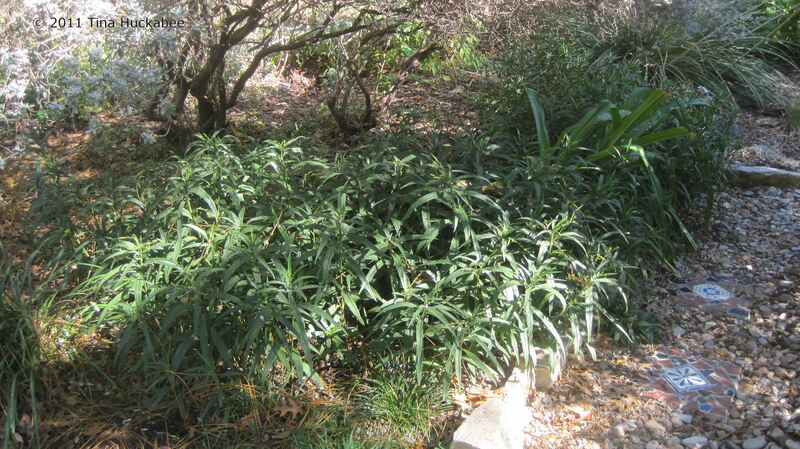 However, it is root-hardy in Austin and can be evergreen in mild winters. I love it mixed with a pass-along Crinum Lily (unknown name) from my parents’ garden. When these two plants bloom (both are light pink summer bloomers), it’s a lovely combination. The foliage of the two plants work well together, too. ‘Chi Chi’ Ruellia blooms throughout summer and into fall. In hot August, the flowers are soft, fresh and pretty pink as they greet me sweetly early in the mornings. The individual flowers drop off by mid-afternoon and new flowers open early the next day, so there is a long succession of blooms. If we have rain, ‘Chi Chi’ will bloom into October. 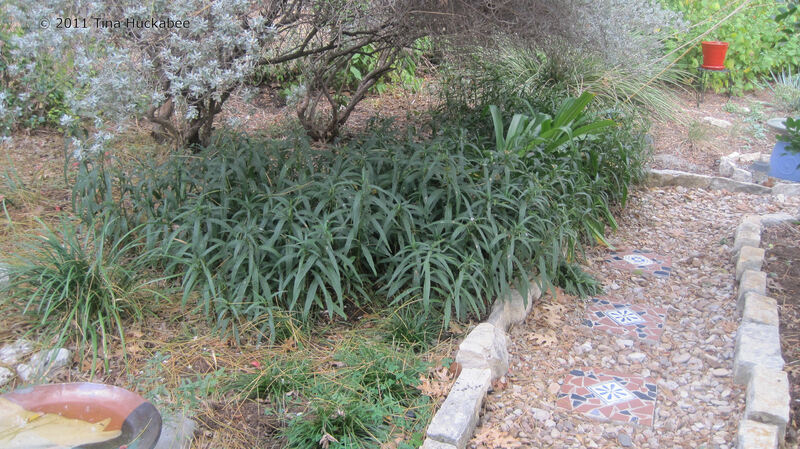 This plant is xeric and requires little care once established. It’s a tough plant that adapts to a variety of growing conditions. ‘Chi Chi’ has a rhizome-like root and spreads by root colonization and by seedlings. 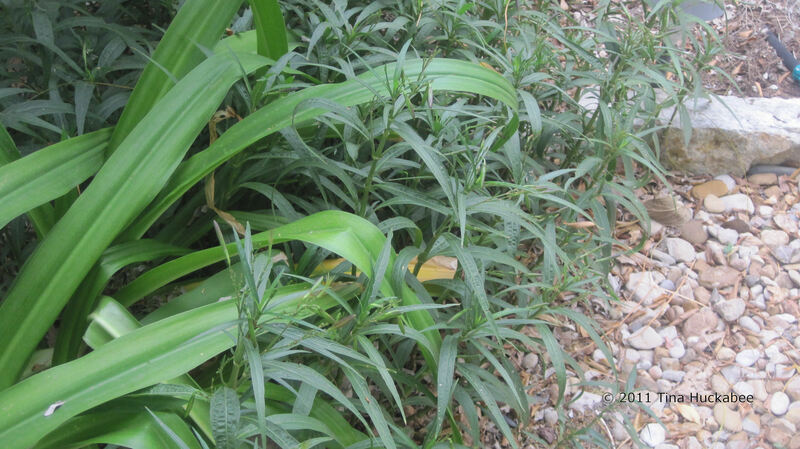 It can be invasive (especially with regular irrigation) and that’s something the gardener should consider when planting any ruellia, especially a non-native like the Mexican or the ‘Chi Chi’. If you live near a green belt, I would hesitate to recommend the ‘Chi Chi’ for your gardens because of its propensity to propagate. As with most flowering perennials, it’s very happy to have more irrigation, but it becomes troublesome with that extra water. 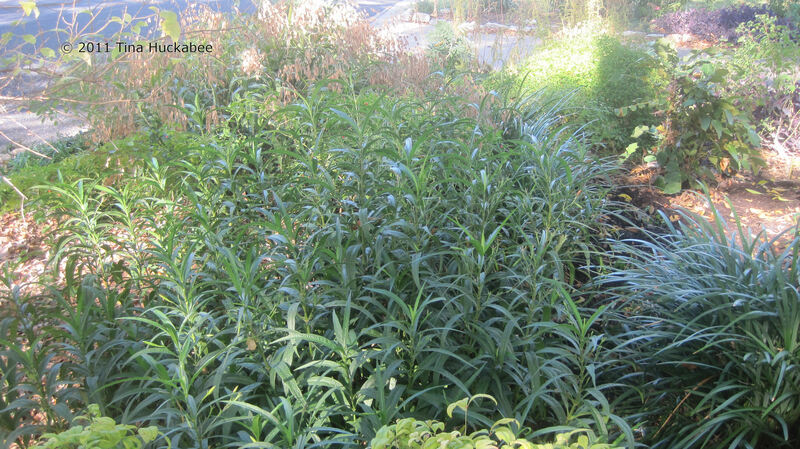 In my personal gardens, it primarily spreads in the immediate vicinity of where the original was planted. In this spot, the stalks have insinuated themselves into the rock walkway. Now that we’re getting some rain in Austin (finally! ), I’ll take a shovel and dig them out to tidy the area. When the soil is dry, ‘Chi Chi’ can be hard to remove. About four years ago, in order to diversify the plantings of one of my gardens, I removed a large colony of well-established ‘Chi Chi’. Or at least I thought I did. 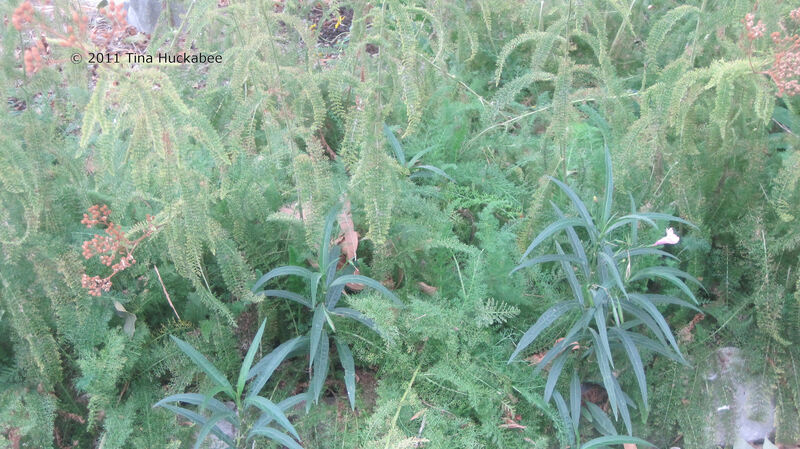 I inadvertently left some root when I re-worked this bed, so stalks have developed in a colony of Yarrow. I could let the Yarrow and ‘Chi Chi’ duke it out, but I think I’ll excise the ‘Chi Chi’ myself. In this drought year (gosh, that’s getting tiresome to say), the ‘Chi Chi’ didn’t bloom as much as usual, nor did they grow quite as tall as is typical. Normally, ‘Chi Chi’ grows over two feet tall. This year, this group in particular only grew to about fifteen inches. It survived though and with very little care. 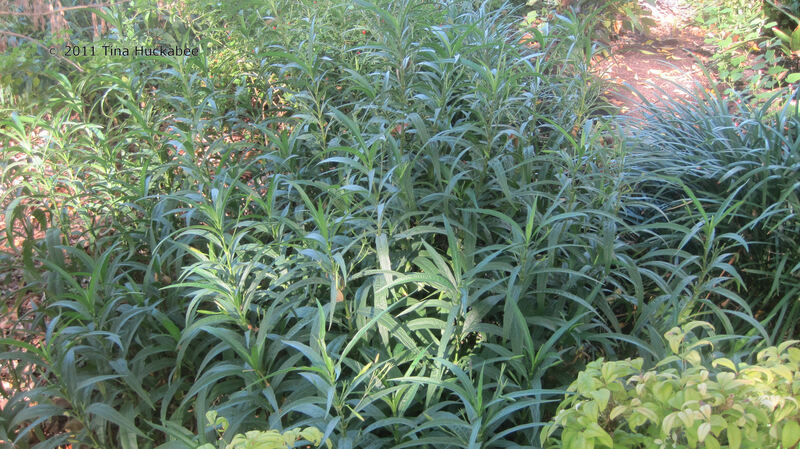 ‘Chi Chi’ Ruellia is a hardy, tough plant for Central Texas gardeners. I’ve seen it in shade, sun, containers and as an indoor plant. It isn’t picky about soil-type and bees and butterflies will visit the flowers. ‘Chi Chi’ blooms in the hottest time of the year–always a gift in Central Texas. However, it’s a plant that can be a bit of a bully, so take that into consideration before inviting ‘Chi Chi’ to your garden party. 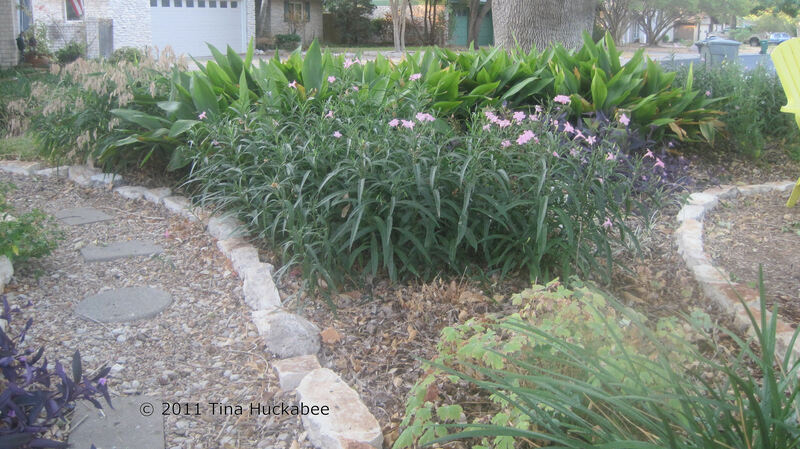 This entry was posted in 'Chi Chi' Ruellia, Invasive, Pink Ruellia, Xeric plants by Tina. Bookmark the permalink. Nice post, thanks for all this detail on growing ruellia. It’s nice to see someone else grows ruellia on purpose. I had the pink and really liked it, but don’t think it came back this year so will have to look for it again. Your path with the rock and tile is really nice too. That’s cute–“on purpose.” Yes, I have mixed feelings about growing this plant, but it’s just so tough (and hard to remove!) that I keep it around. If you’re ever in Austin, let me know–I have lots to share.